In February and March 2004, the Roma unemployed in Slovakia responded to cuts in welfare provisions with demonstrations and looting. The state's response involved the greatest mobilization of police forces since the fall of Stalinism. Although the unrest was crushed, it managed to secure better conditions for all unemployed in Slovakia. Slovakia, formerly a part of Czechoslovakia, became an independent state in 1993. At that time, the transition to a market economy which started after the “Velvet Revolution” of 1989 was already under way. One of the first effects of the process was mass unemployment, which started at a meager 1.6% in 1990, but grew to almost 12% by 1991 and reached a historic high of 19.2% in 2001. The Roma minority, which has been living in present-day Slovakia for centuries, was especially affected by the economic transformation. Under the Stalinist regime (1948 – 1989), many of them occupied unskilled positions in agriculture, manufacturing and construction. The regime pursued various paternalistic social policies intended to fully integrate them into the economy and forcibly assimilate them into the Stalinist version of a “civil society”. On the one hand, these authoritarian policies included forcible dispersion of the Roma communities among the population, compulsory wage work, the promoting of sterilization as a form of planned parenthood among Roma women, and the education of many of their children, irrespective of their abilities, in “special schools” intended for intellectually disabled children. On the other hand, the policies led to increases in urbanization, literacy rates and life expectancy. The single-party state also suppressed open racism in employment relations or public culture. One of the goals of the Stalinist regime was to completely do away with Roma settlements in the countryside (some of which lacked sanitation) by 1990 and to provide their former inhabitants with the kind of standardized housing that had become symbolic of the former Eastern bloc. With the fall of the regime, such centrally planned policies were abandoned. Collectivized agriculture and state businesses were quickly privatized or went bankrupt. Roma workers, many of them unskilled or less qualified, were some of the first to face mass layoffs. Racism and discrimination (including from the police), which went hand in hand with rising Slovak nationalism that led to the dissolution of Czechoslovakia, came back with a vengeance. Many Roma people found themselves out of work, unable to find any new jobs, and in a more and more precarious housing situation. Therefore, the population of Roma settlements, including ones that are geographically segregated and lack basic amenities, swelled during the 1990s. By 2004, the unemployment rate was 51% among Roma women and a staggering 72% among Roma men. Put briefly, most of the Roma were among the defeated in the transformation process. After a period of nepotist transition under Vladimír Mečiar, Slovakia resumed the process of integration into the world market and transnational political structures. In the 1998 election, a left-right coalition government led by Mikuláš Dzurinda toppled Mečiar with broad popular support. It opened the country to foreign investment and introduced some reforms, including in the labor market. In 2002, it was replaced by a more openly right-wing government (led, again, by Mikuláš Dzurinda), which introduced a flat tax and implemented a series of “neoliberal” reforms in welfare, health care, education, the pension system, public transportation, and labor legislation. The reform of the welfare system (passed in 2003, effective since February 2004) included elements of “workfare” and steep cuts in welfare provisions to the unemployed. These could reduce an unemployed family's income by 22 to 53%. Poor Roma families were among the most affected by these measures. At the beginning of February 2004, as the unemployed all over Slovakia received official notices from the government informing them of the changes, demonstrations broke out in the southeastern and eastern parts in Slovakia. On February 11, the first supermarket was looted by about 80 people in the historical town of Levoča. In the following days, the protests quickly spread to at least 42 towns and villages. Some took the form of peaceful assemblies and demonstrations, others involved the looting of supermarkets and grocery stores and clashes with the police. The media quickly reported on the alcohol and cigarettes that the looters allegedly were most keen on. Less reported were banners like “We want work, not food stamps” and “We've had enough of capitalism”, or the fact that some of the early, peaceful protests were also attended by unemployed members of the “white” majority. Unfortunately, the media operation succeeded in establishing the image of hordes of barbarians asking for “free stuff”. After all, such a view was fully in line with the dominant racist discourse. As a result, the protesters had little support, if any, from the general population – even though the total unemployment rate stood at about 18% and the various reforms were generally disliked and opposed by trade unions. At first, the government denied any link between the unrest and the welfare reform. Only as the protests spread did officials admit that some of the municipalities were inadequately prepared to provide “activation jobs” (i.e., mostly unskilled jobs, often in community service, as part of “workfare”) to the unemployed. As the protests turned into looting, the government quickly became nervous and decided to clamp down. In the largest police and armed forces operation since 1989, over 2000 troops were mobilized and sent to the affected regions. Army helicopters patrolled some of the demonstrations. 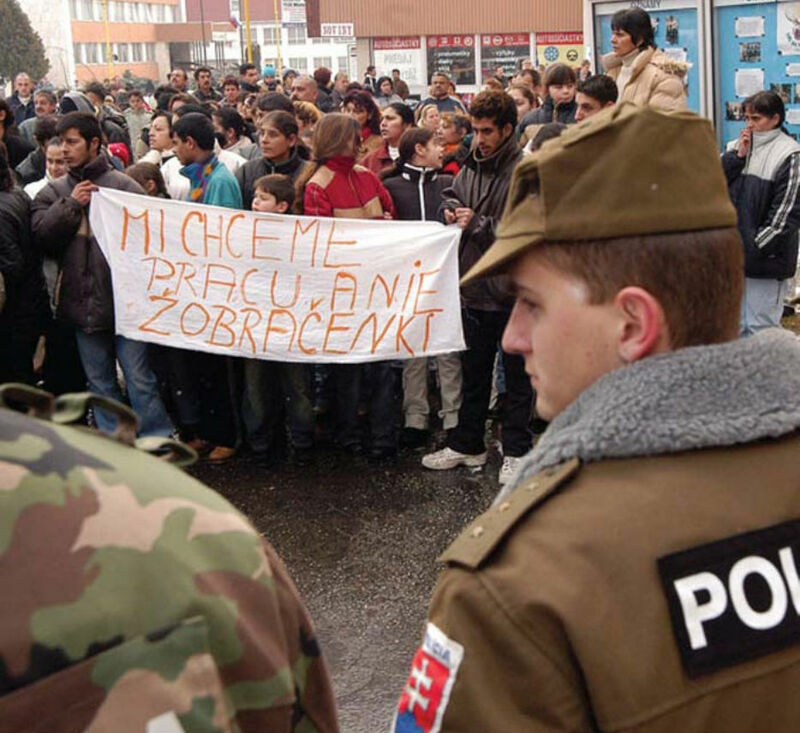 The most significant confrontation occurred on 23 February 2004 in Trebišov (southeastern Slovakia), where police attacked an “unauthorized” Roma demonstration, attended by about 400 people. Using teargas and, in the freezing February cold, water cannons (reportedly for the first time since 1989), they pushed the protesters out of the town center. Early next morning, around 240 policemen attacked a settlement the protesters were suspected to live in. Conducting house-to-house searches without providing any form of warrant or authorization, they beat people (including pregnant women, children, and persons with disabilities) using batons and electric cattle prods, leaving burns on their skin. During the 12-hour raid, up to 40 people were detained, only to be further abused while in custody. Using force where necessary, the unrest was subdued in all of Slovakia by March 2004. In total, 200 Roma people were arrested (111 of them women), of which 42 were later convicted. Although the protests failed to develop into a real movement and were swiftly defeated by brute force, they shook the country and had a lasting impact. Soon afterwards, the government made important concessions. It increased the so-called activation benefits by 50%, introduced scholarships and various subsidies for pupils and students from poor families, and increased funding for placement opportunities for the unemployed. These changes affected all of the unemployed in Slovakia, regardless of their ethnicity. By putting up a fight and bearing the brunt of inevitable repression, the Roma unemployed, these losers of the transformation process, managed to secure at least somewhat better conditions for all. This article is dedicated to the more than 70 000 of our working class brothers and sisters living in segregated settlements across Slovakia (as of 2013). Marušák, M. and Singer, L.: “Social Unrest in Slovakia 2004: Romani Reaction to Neoliberal ‘Reforms’”. In: Sigona, N. and Trehan, N. (eds. ), Romani Politics in Contemporary Europe: Poverty, Ethnic Mobilization, and the Neoliberal Order, Palgrave Macmillan 2009. Excellent article thank you for writing/posting! Can I just check are you using "Karmína" as your author name?